Family will be greeting friends from 6-8pm Monday, June 25, 2018, at the funeral home. Graveside services will be held at Resthaven Cemetery, Tuesday, June 26th at 10:00 am. Tony W. Osborn raced to heaven to meet his mother, Nelda; Stepmom, Sherry; and his grandparents. He left behind his biggest fan, his father, True; his brothers, Terry and wife Missy; Mikey; and Derek; Sisters, Jennifer & Kristine, and their spouses. He also leaves behind aunts; uncles; nieces; nephews; cousins and friends who truly loved him. Tony was born in Oklahoma City on January 23, 1970. 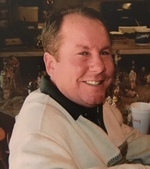 He graduated from Moore High School in 1988 and worked most of his life in the family business. Tony’s greatest passion was the race track. He grew up racing three-wheelers and progressed to cars as he grew into adulthood. Tony's passion for racing followed him throughout his life. To send flowers to the family of Tony Weylin Osborn, please visit our Heartfelt Sympathies Store.